Remember when Russell Westbrook averaged a triple double in consecutive seasons? Yeah, that happened. It was a big deal the first time around, enough for him to win an MVP, but it wasn’t as talked about the second time it occurred. But today, Russ made history against the Brooklyn Nets. After finishing with 21 points, 17 assists and 15 rebounds (recording his 108th triple double of his career), he passed Jason Kidd and became third on the all-time triple doubles list. He only trails Oscar Robertson and Magic Johnson now and can possibly pass Magic if he keeps the pace up. 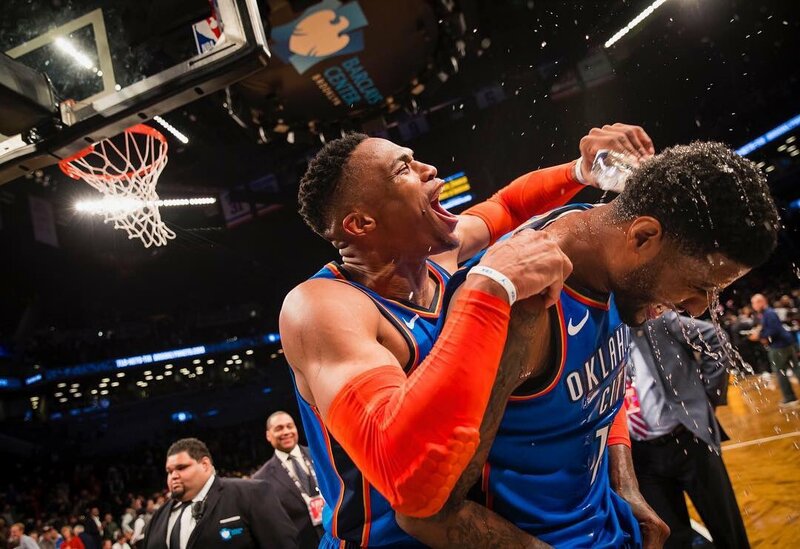 Meanwhile, his teammate Paul George went dumb in the fourth quarter, scoring 25 points and leading the Oklahoma City Thunder to another victory. PG13 finished with 47 points and 15 rebounds on the night. He hit the go-ahead 3-pointer that sealed the win for OKC down the stretch at the Barclays Center. The Thunder move to No. 2 in the Western Conference with the win.